A slow journey, in contact with the nature, far away from the touristic and chaotic England. We cross by bike the green countryside of Wiltshire (south-west of England) until the house and garden of Bowood. 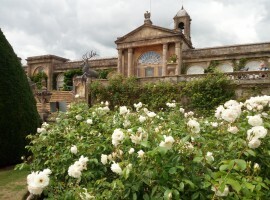 Discovering animals and art, trees and ancient architectures, games and waterfalls. Are you ready to leave? 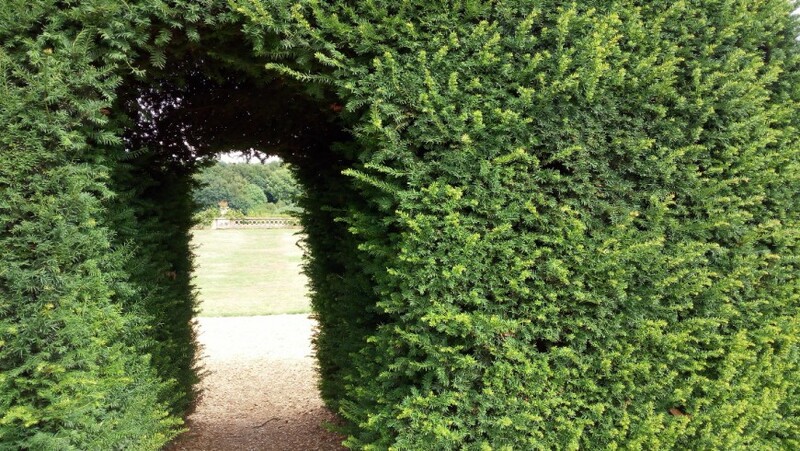 When we think about England, we image green heaps of grass, an ancient stone house completely covered by ivy like in a fairy tale, gardens and tunnels between the leafs to cross by feet. Our first adventure by bike in the Wiltshire, a green region with hills and lakes in the south west of England, has exactly this atmosphere. 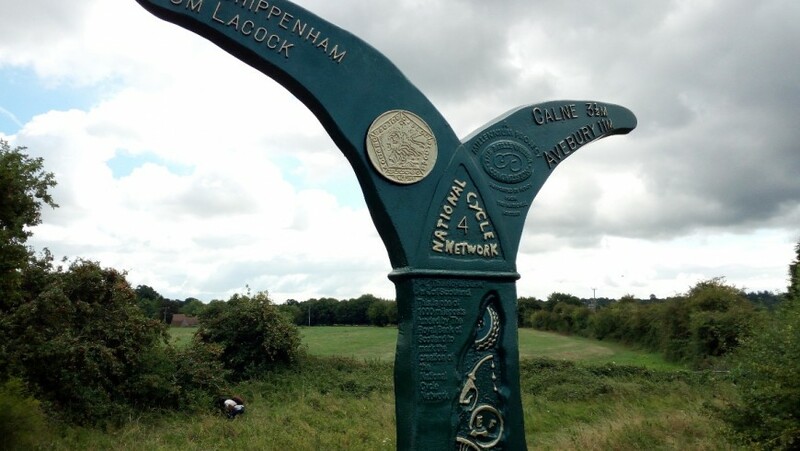 We start by bike from Chippenham, a little village in the countryside of Wiltshire, 150 km in the south-west of London. 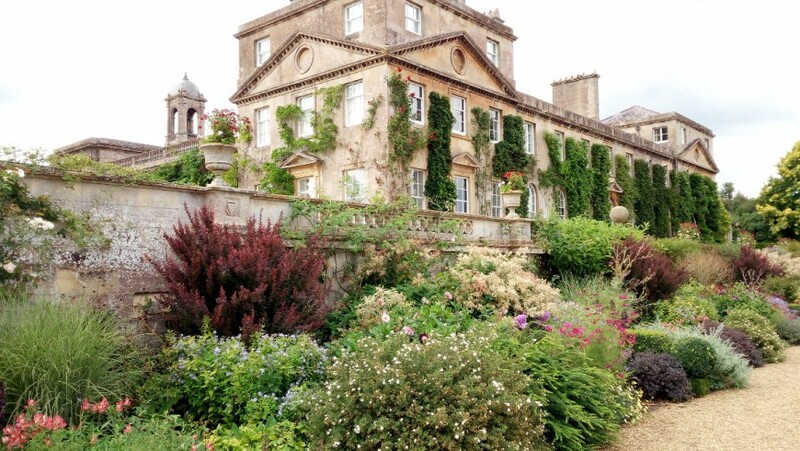 The destination is Bowood, an ancient residence in the countryside with the interiors of Robert Adam and a spectacular garden projected by the architect Lancelot “Capability” Brown. We cross the calm streets of Chippenham until the green park that crosses the village along the river Avon. We ride along the banks of the river observing the swans and the gooses swimming in the calm water of the river. 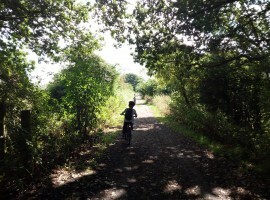 We pass close to a big playground and we continue on the cycle track that crosses the park of Chippenham. Later, we take the cycle track n. 403, that is part of the English national network. 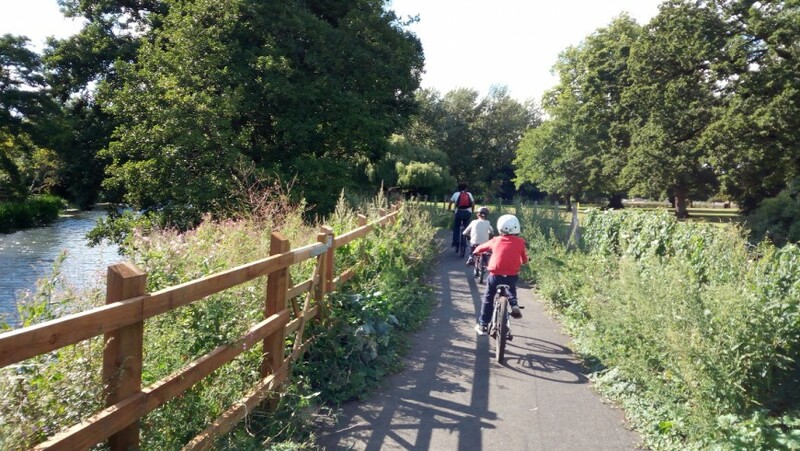 Our trail is part of the network of cycle and pedestrian tracks at a national level in the entire England. More than 14.000 trails are safety and without traffic and cross from north to south the whole country connecting villages and cities. Similar totems indicate us the right direction and the distance to reach other places. At this link it is possible to have a look to the entire network of cycle journey in England. 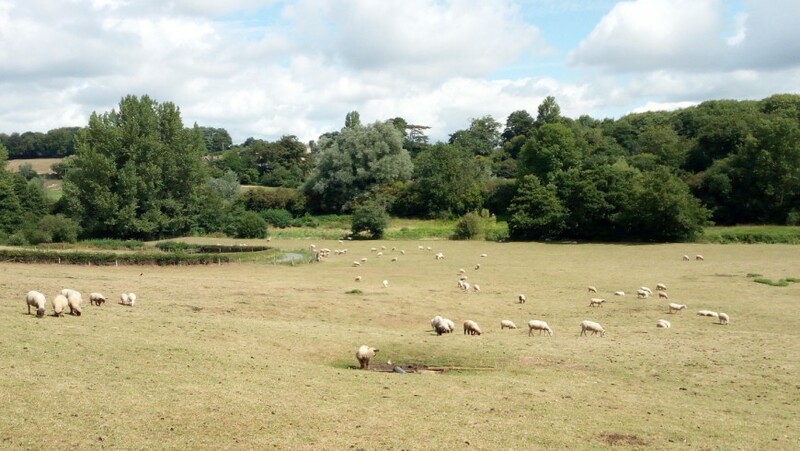 By riding we move fast from Chippenham and after few minutes we are covered by a rural landscape and intense green. Grazing land scattered with sheeps, cows and horses, and some farms. The cycle track is quite flat, in part paved, in part not, and on the sides it hosts trees, blackberry bushes and shrubs of every types. 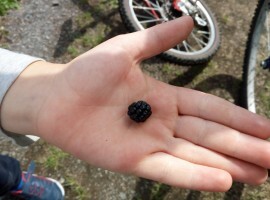 Sometimes the kinds decide to do a pause to pick the most mature and sweet blackberries. Then we restart riding covered by the green (in some place the vegetation is so thick that it forms some natural tunnels), crossing bridges and admiring new landscapes. 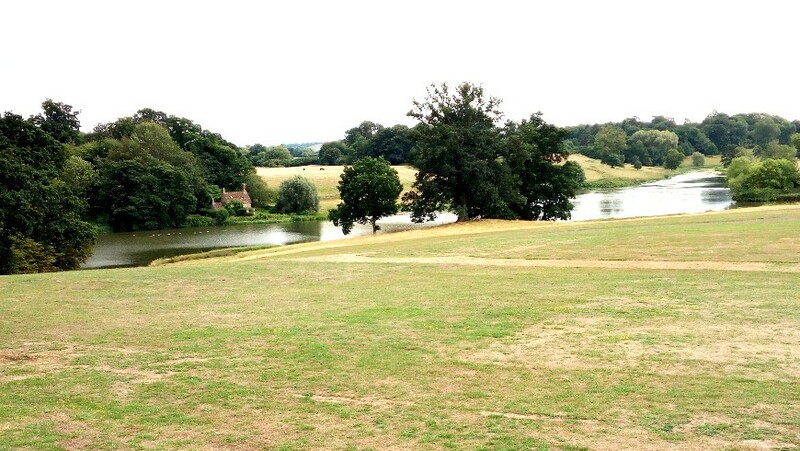 After one hour of riding ( the track can be done in half an hour but we decided to do it without any pressure) we arrive in Bowood. Bowood house and Garden is a vast park with a country residence of the 18th century, open starting from some years ago to the public. By paying the ticket ( here you will find more info about the hours and the prices) you can enter in a world that was a time reserved only to aristocrats, visit the beautiful gardens projected by Lancelot “Capability” Brown, with some beautiful and crazy landscape works, like the doric temple. 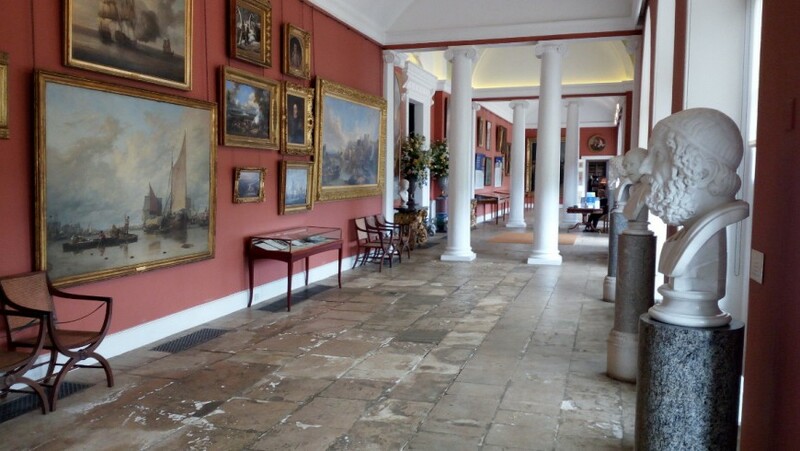 You can have a walk in the big rooms of the house open to the public and furnished by Robert Adam and admire the beautiful collections of paintings, classical sculptures, jewels and Indian objects. One of the room of the house was the laboratory of Joseph Priestley, that exactly here, in the year 1774, discovered the oxygen. In front of the house we relax in a beautiful Italian style garden: little and regular alleys, perfumed roses, vegetables sculptures and landscape in the vegetation obtained with the pruning of evergreen bushes. Every walk hides a new discovery, between parfums of flowers and unique glimpses. The park of Bowood it is one of the most beautiful parks projected by Capability Brown and one of the most important and historical parks of England. More than 8 square kilometers of sinuous nature, fields that descend from the house, islands of centuries-old trees, a very big lake hosting ducks, gooses and swans. 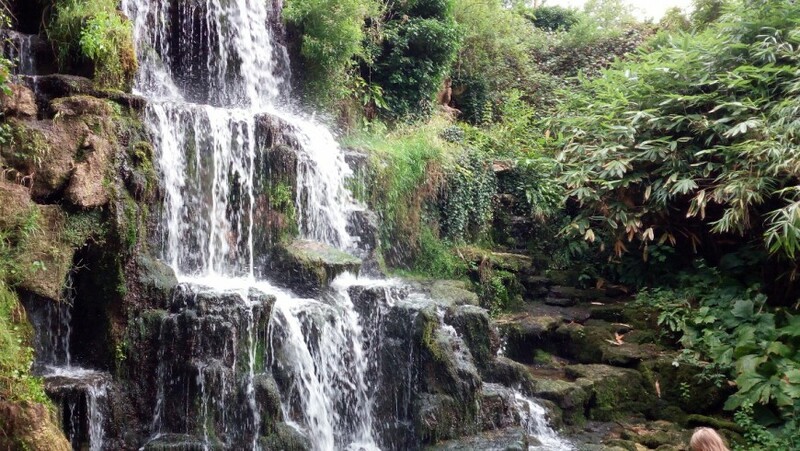 The two most original elements of the park are the doric temple, projected by Capability Brown and the waterfall realized during the last years of the 19th center by the architect Charles Hamilton. To reach the last one we walk on a curvy trail between the rocks and dug like a natural canyon, with caves, breaches and even a secret passage. A narrow and dark gallery that opens after some meters on a natural spectacle of the waterfalls. 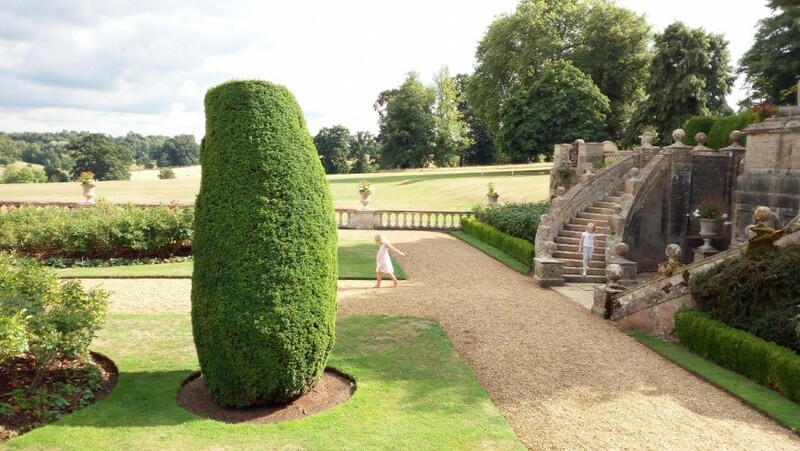 Furthermore, an area of the garden of Bowood is dedicated to children with beautiful wood games for children of every age, until 12 years old. 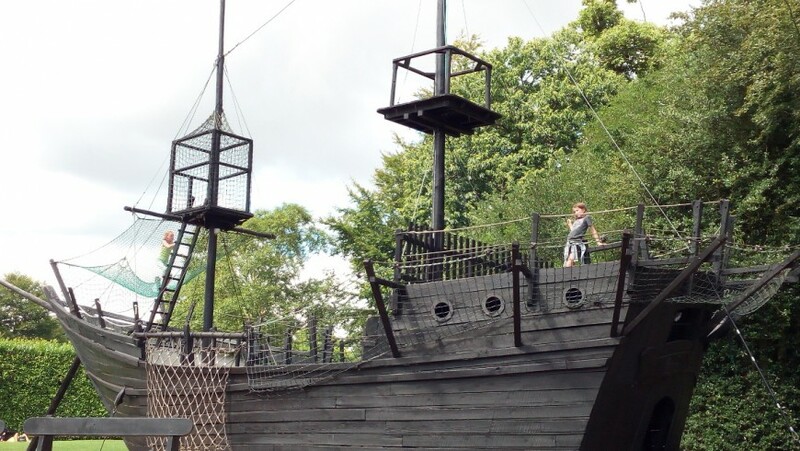 You can climb on the ropes of a big galleon magically landed on the grass, walk at ten meters high, slip and jump. 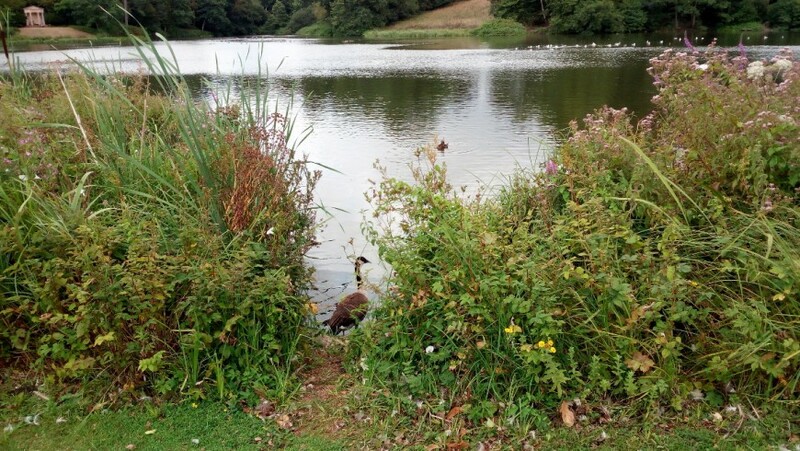 Furthermore, one area of the park is dedicated to the animals of the farm. 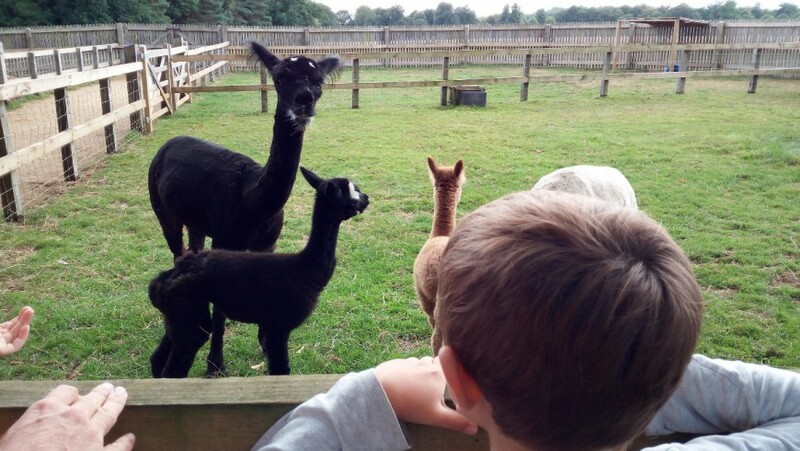 In this way the children can pet a white horse, or an alpaca, observe the little pigs playing close to their mother, admire the chicks, the ducks and try some simple games of the farm tradition. 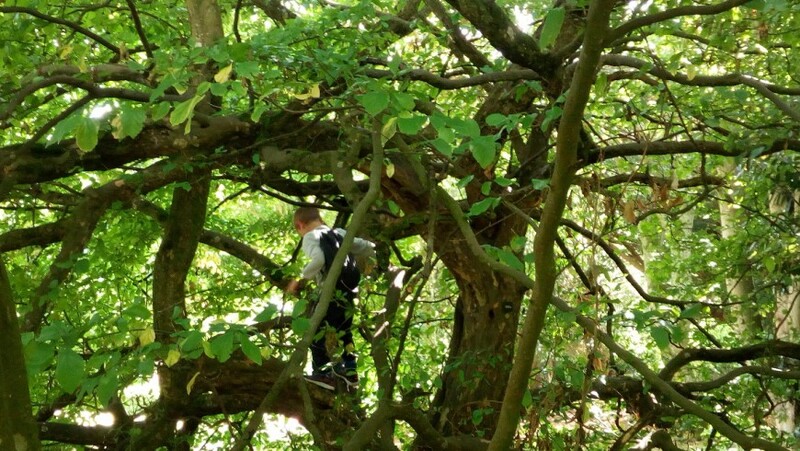 But for the kids the most amusing play is always the same: climb the branches of the a big tree barefoot. 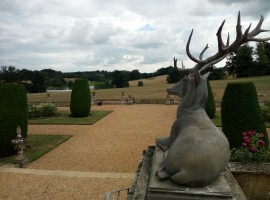 And in the gardens of Bowood you can even do that! Before the departure: please have a look to the official website of Wiltshire and to the map of the pedestrian and bike paths of England. 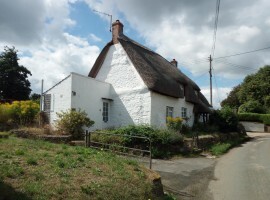 Accommodation: choose one of the eco-sustainable accommodation in the south of England. Little B&B in ancient villages, restaurants with rooms, but also organic holiday farms surrounded by the countryside and glampling. 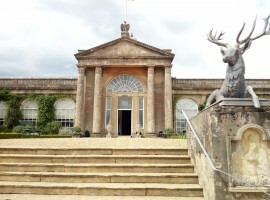 This entry was posted in journeys and tagged bike tour, Bowood, England, green journey, Wiltshire. Bookmark the permalink.